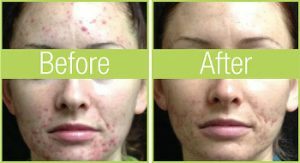 Advanced Biophotonic Acne Therapy that is FDA approved to treat acne and reduce inflammation and lesions. Celluma is a light energy device based on NASA LED technology that uses wavelengths of blue, red, and infrared light. Celluma is FDA cleared to treat many skin conditions with no pain, down time, or side effects. Light energy is emitted from the Celluma’s shape-taking light array panel, and absorbed at the surface of the skin to re-establish cellular health, and up-regulate cellular function. A patented delivery system emits three specific wavelengths of modulated (pulsed) light controlled by proprietary software algorithms. All three wavelengths work synergis­tically in each of the Celluma’s programs to optimally address specific conditions. The benefit of using three wavelengths is that light-absorbing molecules respond to different wavelengths of light energy, resulting in a targeted increase in cellular activity. For example, some reduce inflammation and some kill bacteria, while others enhance localized circulation. LED Light Therapy has been researched and shown to help smooth skin texture, improve skin firmness and resilience, up-regulate the lymphatic system activity, restore and renew skin’s natural cellular activity, and reduce the appearance of wrinkles, fine lines and superficial hyperpigmentation (dark spots). 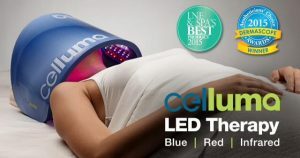 The Celluma LED Light treatment is for all skin types and will not erode any part of your skin, is painless, non-invasive, and there is absolutely no downtime. Clients can return to their normal activity immediately after the treatment with no restrictions. For optimal results 30 minute treatments twice a week are recommended for a duration of 4-6 weeks.